Background collisions, SFX and TURBO! Well, today went really well, I fixed up my collision routines with the scrolling background, yup, it was using a simple offset, with a case for looping every 32 row increments, seems to work well. Possibly un-optimised but good enough so far. There’s some rudimentary noises from both cars on screen based on their speed and distance from each other, also collision noises are in there now. The fuel-o-meter has turned into a working turbo bar to help catch-up or overtake other racers. 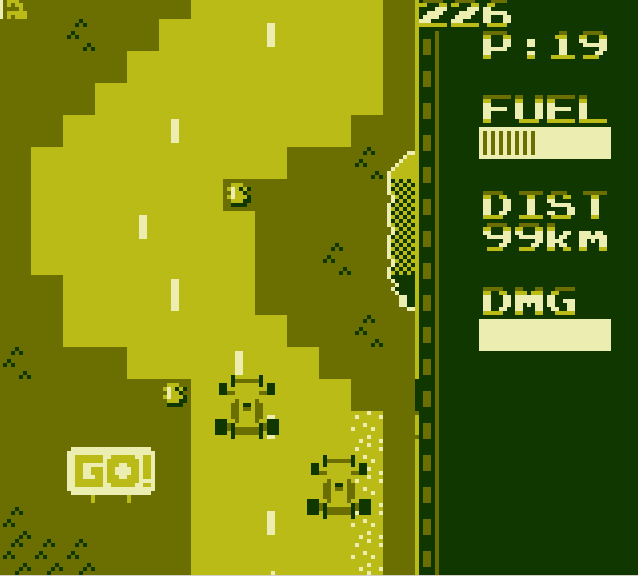 It’s getting there, but I’m down to 4kb of ROM remaining now and the racer A.I. needs improving on the sly. I’d like to get some BGM in there also somehow. CPU Usage is getting pretty high now though, so I may need to inestigate into other ways to load my level up. Setting colours for each tile through a switch is probably slower than referencing another variable directly I imagine but, well, a balance needs to be struck. Tomorrow I’ll most likely be sorting out the code into banks to save space and going from there with more advanced A.I. (Not simple homing, falling of the track A.I.) those cars need to fall foul to going off track also and that’s going to be inetresting to set-up correctly! Screenshot tonight is from the gameboy classic mode where, yes. Identical cars. I’m not too fussed about that. I am fussed about adding some steering animation though!